I recently bought four eyeshadow sticks, I decided to buy one a different brand to make sure that I am giving a fair review for drug store eyeshadow sticks. 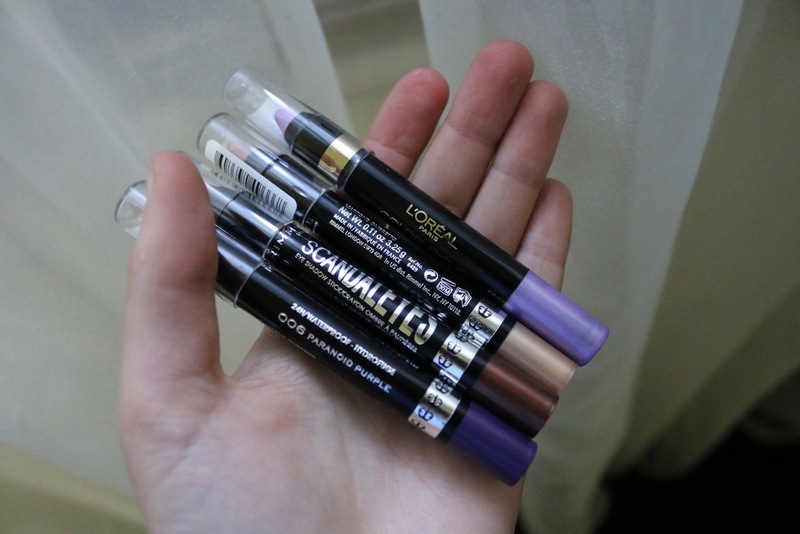 So I got a metallic bright purple from L'oreal and a dark metallic purple, a bronze and a champagne colour from Rimmel London. I chose these colours because they all correlate together and can be paired up and worn together. This is shade 006 Paranoid Purple. It says that it is 24H/Waterproof. As you can see from the photo it is a very deep purple with a metallic look to the stick. This is the shade 003 Bad Girl Bronze and states that it is 25H/Waterproof. Just like the dark purple it is metallic but this one seems to have an over-matalic coating which I think is a downer for the product. Although it could have just had a metallic top coating and then not be metallic at all. This is the shade 002 Bulletproof Beige. It is 24H/Waterproof. This does not look like it has a metallic top coat which is a very good thing, it means that there will be the same on going pigment throughout the stick. Unlike the rimmel ones this stick does not have a shade name on the packaging although it is a very obvious and unique colour to the L'oreal collection. I was a bit disappointed at this stick as the first layer did give the impression that this was going to be a metallic purple, but once I swiped that first layer off it was no longer metallic and was just a matte purple. I swatched each shade to show you what each colour would look like. Now as you can see the purple is very pigmented for a light purple which I definitely appreciate, it also has a bit of a holographic shimmer in it although it is not noticeable on camera. It is definitely the most metallic of the four which is a great thing. This is probably the best quality shade that I picked up. It certainly does have a red undertone and a slight shimmer although it is not noticeable until you look at it close up. I would recommend this being a crease colour, it is very pigmented and you only need to swipe the stick once and you have a lot of product. I was probably the most disappointed with this shade as it looks more of a black shade than of a purple shade, I would have liked for it to be a bit lighter to give a more natural eye look as I personally don't go for very dark eye looks. There is a hint of blue holographic shimmer when I moved my hand. The light purple shade did not blend very well, the product kind of just moved and didn't fade nicely. Shade 002 blended a bit better and did not loose it's shimmer when blended. The shade 003 would take a bit of a while to blend properly because it is a dark colour, but it does blend better then the light purple. Shat 006 probably blends the best, as you can see from the picture above. In the image above it shows how well the eyeshadows wipe off, I used micellar water which does not wipe off waterproof makeup. Although it says that 002 is water proof, just like the L'oreal one comes off very easily. Although the two darker shades which say that they are waterproof, are mostly waterproof. To get the colours off of my hand I had to use a waterproof makeup remover. I used the light purple from L'oreal as a base colour and the 006 as a crease colour. The light purple did loose a bit of pigment from the blending but it is still visible, the 006 shade did blend very well into the colour and mixed well with the lighter purple. You would need a small crease blending brush to have more control as the 006 does blend well but it also moves around quite a bit. The image above is using the shade 002 as the base and 003 for the crease, the 003 shade did not blend very well as it mainly just moved. I am not sure if this is only because the base is shimmery but it moved a bit to much and did not blend very well at all. I don't wear makeup, but I think I would trust a pallet eye shadow more than a stick. I will steer clear of that purple one, too. I admit I bought an eyeshadow stick just to try it out and see what it was like. It was quite a bit of money for just one color. I don't wear eyeshadow so I probably wasted my money on it because I've only used it a couple times . I have a few eyeshadow sticks. I do like them for when I need to get out the door quick and I'm not really getting crazy made up. I agree that they do have their weak points, though. I totally agree, they are great to put on if you are in a rush, thanks for the comment! I've bought a few eyeshadow sticks back when I was younger and I must admit that I like their quality better than the palette ones. However, the ones I was buying weren't great quality products though. I have some eyeshadow sticks, but I use them mostly to line my eyes. I really should test them out for a complete eyeshadow look. That's a great idea, I will definitely give lining my eyes with them! I have a bunch of these types of eyeshadow sticks. I dont use them for inital application - I use for touch-up at the mid-day (easy to stow in my purse) when my usual eyeshadow has worn off! I honestly never really had any luck with eye shadow sticks in the past. However, I really like the light purple shade. I remember when eye shadow sticks first came out. I bought them in every brand in my favorite colors, trying to find ones that lasted. I have had horrible luck with them staying longer than a few hours. I love wearing eyeshadow! These eyeshadow sticks look like they are worth a try. The colors are nice too for various outfits! I like giving my eye some color to make the brown in my eyes pop! I love eyeshadows that are fun hues. I always get scared that the creamy ones are going to leave a crease though. I hate when they do that! The eyeshadow colors look nice and would pair nicely with a cute spring outfit. It would be interesting to try an eyeshadow pencil to see how it works and if it's something worth wearing often. You should definitely give one a try but make sure you look at some reviews of them before purchasing! I would have to say that I prefer the palette, but these are great especially for people who barely have time to do their make-up in the morning. It's convenient and it's easy to put in your purse. I totally agree, if your a busy person these are great (I also prefer the palette) but I love to try new things! I have mixed feelings on shadow sticks. I think they are great for on the go and it you want an intense look but I do find they don't blend as well and can tug at the eye. I totally get that, but eyeshadow sticks are great because you can just put them in your bag and touch up throughout the day! I would have loved to have seen how these look on your eyes and how they look over time throughout the day. I haven't used something like this since middle school, but I could see how they would be valuable if you were in a rush. I would worry they would crease a lot in the sun. Those colors are so nice. I've never heard of eyeshadow sticks before, they're probably so handy. I'd love to see how they look on ! they look like they would be okay to use on your eyelids but I wonder if it creases. So I personally like them because the compact eye ones always become messy and I always break them, with these, i dont! I love these color shades! So beautiful! I am in need of new make-up and I used to have eyeshadow sticks but I found the colour tended to bunch in the creases after a while so I wouldn't buy them again. I like how bright the sticks are. I've not used them before but I think they could be nice for consistent color. I love your review. My experience is that the color didn't glide on well, it rather pulled my skin and then was hard to blend. I think these are great for throwing in your purse or bag. No mess, and no brush required! I haven't tried an eyeshadow stick in years, though. I totally agree with you. I also didn't like the purple one. Thank you so much for your feedback about these. I actually have some of those shades and I like it. i love the colors. i'm such an eye makeup junkie. i'll have to try these out. I've never used an eyeshadow stick before - I'm definitely a palette person because of the blendability. (Is that even a word? Haha!) I think these would be handy for on-the-go touchups, though!